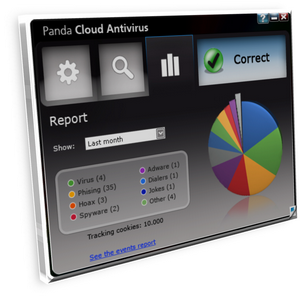 Panda Cloud Antivirus releases its latest version 1.4 which delivers the next evolution of Anti-Malware technology. As all know Panda Antivirus is cloud-based, developed by PandaLabs that is connected to their Online Collective Intelligence Servers to protect against various malware and malicious programs. URL Filtering Compatibility with IE 9 and Firefox 4. Panda Cloud Antivirus has reputed as powerful security suite vendor making it an effective alternative to the security powerhouses. Cloud Antivirus works the same way other Antivirus Solutions do offering a Quick Scan and a Custom Scan, but its inner features are exceptional. It opts out of automatic threat management. Filter Threat Report by All, Last 24 hours, Last Week, or Last Month. Recycle Bin pane from which you can recover a false positive, if you need it. Clean User Interface, better compared to its previous versions. Less Impact on System's Performance. Less Impact on Computer Start-Up Time. Runs at 15MB of RAM when idle and 60MB when scanning. Great choice for NetBook users. Comes with 30-day trial. Save 20% when you upgrade to Panda Antivirus Pro ($23.95). Download the first ever Free Antivirus Software from the Cloud - Panda Cloud Antivirus Version 1.4 for free at CloudAntivirus.com.